Did you know that 80% of your memories are comprised by images? It’s therefore crucial to ensure your vision is 100%, such that you can continue to form and recall memories for years to come. We therefore recommend you should have your eyes regularly checked through an eye examination. As the leading independent eye care provider in Thetford, Scotts Opticians will thoroughly assess the health of yours eyes. One of the ways we do this ahead of many of our competitors is by using an advanced piece of equipment called an Ocular Coherence Tomography scanner, or OCT.
An OCT scan uses sophisticated technology to take a series of pictures with a quick and simple scan of your eye. The machine then compiles these pictures into a 3D image which is analysed by our experienced optometrists to identify any abnormalities or areas that might require further examination. 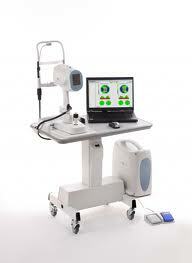 The scan is particularly useful at identifying macular lesions (macular degeneration) or glaucoma at an early stage. The images an OCT camera produces are up t0 25 times higher in resolution than any other retinal camera. This allows us see the back of your eye, as well as take a cross sectional image of your retina in great detail. A regular OCT scan is essential, as when it comes to your ocular health, you’ll have further reassurance that your eyes are well. The degree of clarity the camera produces allows us to identify potential problems before they can even cause you a problem. We recommend that you have an OCT scan as part of your regular eye examination to enable us to determine whether any changes in your sight are as a result of normal wear and tear or a sign of a more serious condition. The scan itself takes approximately 12 minutes. There is a charge levied for the scan, as it is not covered by the NHS. We feel however it is a small price to pay for the reassurance it provides. If you would like more information about an OCT, or to book your next eye examination with Scotts Opticians, please don’t hesitate to get in touch. You can contact us today by calling 01842 764831 or use our online booking form.